Lloyd Law College admission in BA.LLB is based on Lloyd Entrance Test (LET). Lloyd Law College Greater Noida and is affiliated to Chaudhary Charan Singh University, Meerut. Lloyd Law College was established in the year 2003. The affiliation is approved by the Bar Council of India. Lloyd Law college application process has started for admission in academic session 2018-19 in 5 years BA LLB and 3 years LLB program.11 batches of LLB 3 year program and 9 batches of BA LLB 5 year program has passed out from Lloyd Law College. Lloyd Law College Seats: 240 seats in B.A.LL.B 5 year integrated program. Latest Update: Lloyd Law Result has been released and is available in pdf format on this page. The candidates appeared in LET 2018 can check their LET Result on this page. Age: Candidate should not be more than 25 years of age as on July 1, 2018. Academic Qualification: In order to apply for the Lloyd Entrance Test, the candidates need to fulfill the following eligibility criteria. Therefore the candidates are suggested to ensure their eligibility before applying for the LET. General: Candidate must have passed Senior Secondary School/ Intermediate Examination (10+2) or its equivalent examination with not less than 45% marks in aggregate. SC/ ST: The candidate should have scored minimum 40% in aggregate. Candidates who have appeared in the 10+2 examination and are awaiting results are also eligible to apply. Candidate must have passed the qualifying examination at the time of his/ her admission and should be able to submit its proof. The application process for the Lloyd Entrance Test for the admission in Lloyd Law College was started on 6 January 2018 and the candidates can fill the application form on or before the due date i.e. 16 April 2018. The candidates have to fill the application form correctly for which the candidates are provided with the instructions to fill the application form. So that the candidates are suggested to follow the instructions and step to fill the application form. The candidates first need to register themselves on the official website and the candidates have to fill the details like the Name, email address, Date of Birth, Contact Details etc. The candidates after filling up the details have to confirm the registration details to proceed further. The candidates should check the details and confirm it accordingly. After confirming the registration details, the candidates will move further to fill the application form. After the candidate login in the first page that is "Application Locker". Click on Lloyd Law College from the List of colleges. The candidates thereafter have to choose their application form and click on Apply Button. The candidates should fill all details on the form for each of the sections. The payment of the application fee can be paid by credit card, debit card or net banking. The candidates should know that the application fee should be paid only once. After completing the application, the candidates need to pay the application fee Rs. 1500 along with the online bank charges. Lloyd Entrance Test Admit Card has been released on 23 May 2018. Candidates have to fill in their Email ID as used during the time of registration to download LET Admit Card. An admit card is an important document to bring to the examination centre. In case, the candidates were not able to download the admit card. The candidate may collect the same on the date of Entrance Examination in person before 12:00 noon at Test Centre. For this purpose, the candidate is required to bring two passport size photographs with them. Lloyd Law Result 2018 has been released for admission into 5-years integrated BA LLB programme, the link to check Lloyd Law Result 2018 is available on this page. LET Result contains the name of the candidates along with their LET Marks obtained in the exam. The admission to the program is made strictly on merit based on Lloyd Entrance Test Result 2018 and thereafter personal interview of the student. Marking Scheme: All questions carry equal marks and there is no negative marking. There will be 5 Sections comprising of multiple choice questions only. The student should use blue or black ball point to mark the answers. General Knowledge & Current Affairs: This section will contain questions on General Knowledge and current affairs. English: This section will contain questions on comprehension & grammar. Antonyms, Synonyms, Part of Speech, Idioms & phrases etc. Mathematics: This section will contain questions on Mathematics up to Class 10. Logical Reasoning: There will be questions on identifying patterns, logical links and rectify illogical arguments. There will also be questions on syllogisms, logical sequences, analogies etc. propositions (described in the paper), and a set of facts to which the said proposition has to be applied. 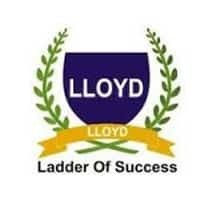 There are total 30 centres where the Lloyd entrance exam will be held on. The list of the complete test centres is given in the table below.